— Robby Mook, former campaign manager to Hillary Clinton. “Too many people on that ABC News set. It looks like a PBS fundraiser.” — Joe Flint, WSJ media reporter. “Beto losing would be amusing, but the Republicans keeping the House and Senate while Cruz loses would be hilarious. So I’m kind of torn rn.” — Alexander Griswold, Washington Free Beacon. “[Marsha Blackburn] probably doesn’t remember it, but I do: In 2008, she came out to Colorado to help with messaging during the DNC. She and I chilled in the sun drenched garden area of the RNC’s makeshift office there and talked about literally nothing involving politics for like an hour.” — Liz Mair, communications strategist. “DON’T LOSE SIGHT OF THIS: For the first time since 2008, independent voters broke for Democrats, per @NBCNews exit polls.” — Kasie Hunt, host, “KCDC,” MSNBC. What would Trump do if Dems won the House? “Speaking with reporters on the North Lawn, Sarah Sanders is asked if President Trump will call Nancy Pelosi tonight if Democrats win the House. She said she’s not sure why he would, since members of her own party said they wouldn’t support her.” — Kaitlan Collins, White House correspondent, CNN. “Van Jones on CNN: This is heartbreaking. (NO BLUE WAVE. )” — Ann Coulter, conservative commentator. “On Fox, Sarah Huckabee Sanders says if Democrats take the house they ‘shouldn’t waste time investigating. '” — Max Tani, The Daily Beast. Paul Begala, Democratic political contributor, CNN: Free speech ain’t so free for @BarbaraComstock. Let’s hope someone is there to broadcast her concession speech. Fox News makes a prediction around 9:30 p.m.
Brit Hume, FNC: Fox News now projects Democrats will gain control of the House. Elana Schor, Politico: U ok Fox News? “I think if you have *breaking* or *this just in* in your tweet it should automatically expire after an hour. the breath-catch only to realize you already read that… 6 times. just sayin’.” — Monica Lewinsky, former White House intern. “Is it possible to be angry and hopeful and drunk and sober all at the same time?” — Preet Bharara, former U.S. Attorney, fired by Trump. TMZ: Dead brothel owner wins his election. Here. NYP‘s Page Six: Alec Baldwin gets booted to Saturday night on ABC after the parking space debacle. The actor says the press got it wrong. So far, he’s not saying how. Here. Splinter: Despise all those domestic abuse accusations, ex-Rep. Keith Ellison (D) is now Minnesota’s AG. Here. “The soundtrack at the Manchin event is exclusively disco music.” — Joe Perticone, politics reporter, Business Insider. “Every election I have friends who ask me “hearing anything?” As if there’s some secret bank of info available outside of exit polls etc. There isn’t.” — Yashar Ali, HuffPost and New York Mag. “People who say voting doesn’t matter are wrong if only because they aren’t going big enough because when you think about it the sun will kinda soon engulf the earth so really why do anything except maximize pleasure and eviscerate your enemies as graphically as possible.” — Asawin Suebsaeng, The Daily Beast. “MOST in the media are absolutely clueless-tonight was a massive win 4 DJT & the ppl he campaigned 4-remember btwn the House & Senate Obama lost 69 seats, Clinton lost 60 seats-the democrats winning the house is meaningless – stay tuned for my analysis on radio & TV. Great night.” — Sean Hannity, non-media host, Trump advisor, Fox News. “Blame game begins. Trump adviser close to WH says Trump is ‘really mad at Ryan’ about ‘everything,’ from immigration to fundraising. Interestingly Ryan world is ready with talking points to push back, noting his fundraising numbers for the cycle and large number of retirements.” — Jim Acosta, Chief White House correspondent, CNN. — Connie Schultz, wife of Sen. Sherrod Brown (D-Ohio), syndicated columnist, journalism prof at Kent State. “If Gillum wins the Florida governorship for the Dems, that will be ENTIRELY the fault of @realDonaldTrump, who intervened for toady DeSantis over the very impressive Adam Putnam. Good one, Trump. So much winning.” — Quin Hillyer, conservative columnist and activist. Daily Caller headline: “Democratic Senator Who Admitted Hitting His Wife Cruises To Easy Victory” The senator is Sen. Tom Carper (D-Delaware). “One nice thing that happened today is that a prescription delivery of mine was messed up, and a pharmacist drove to my apartment to deliver it to me personally after her shift ended.” — Abby Ohlheiser, WaPo. “I’m at a friend of a friend’s house where people are literally practicing swing dancing rn and i can’t imagine anyone further from my current reality.” — Sophie Weiner, night editor, Splinter News. “Beto 2020.” — Andy Lassner, executive producer, The Ellen Show. 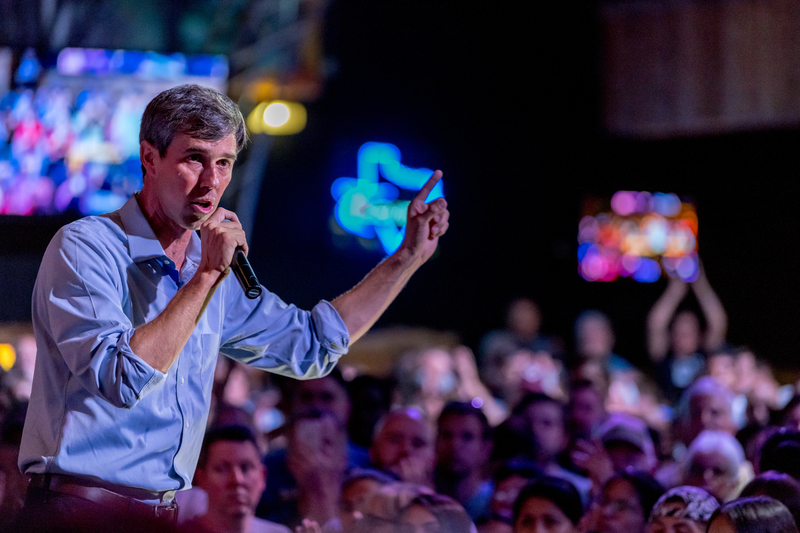 “If Beto gets persuaded to run for president in 2020, he will instantly become a top-tier candidate.” — CNBC’s John Harwood. “The fact that Beto came so close still feels like a big deal.” — Emily Nussbaum, TV critic, The New Yorker. “Beto lost? That’s ok. Now he can run for President.” — Alyssa Milano, lefty activist, actress. “Please no one do any bad tweets tonight.” — Ashley Feinberg, HuffPost.